Every once in a while, I run across something that dramatically changes the way I look at the world. Sometimes that encounter is a recommendation (Frankl’s Man’s Search for Meaning). Other times, it is a gift (Mitchell’s Cloud Atlas). Some memories of how I came across that life-changing work are long forgotten, but I am still grateful for whatever or whoever it was that led me in that direction (Hesse’s Siddhartha). Then there are the times that luck just happened to place the right thing in my path at the right time. On the Saturday night before Mardi Gras/Lent, I had just finished rowing, and somehow through several clicks online, I came across this great article on how to pick a life partner. Although I had work to do, reading the well-written prose piece was much more tempting, so I did. That led to my reading an excellent Part II. Enjoying that one too, I was hooked on my new favorite blog Wait But Why, and that was when I saw Tim Urban had written a piece on one of my biggest problems – procrastination. I couldn’t resist. Plus, I was procrastinating, but little did I know, that single click would alter the course of my reality. Procrastination and I are old pals. The post that night wasn’t the first time I had read advice on how to fight procrastination. Books, articles, and essays have all come my way. I have even taught tips on avoiding procrastination in my classes. While all of those things were great, none of them really gave me something to visualize. That, though, is how Wait But Why’s “How to Beat Procrastination” changes everything. Mr. Urban, the very clever author, explains the whole procrastination process with some nifty cartoons. He embodies the temptation to procrastinate as one’s Instant Gratification Monkey pulling the person into the Dark Playground, the place of unearned leisure. He even creates a great map of a task to be taken on. Wait But Why’s picture of a task at hand. Seriously, check out the article! You will not regret it. 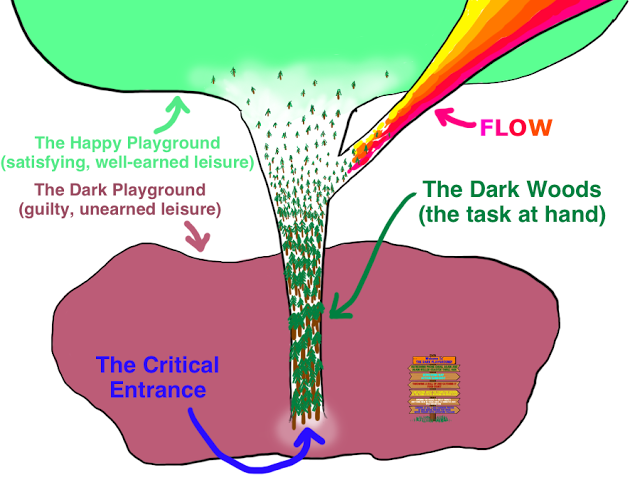 All of that time spent procrastinating is then portrayed as playing around in that Dark Playground. Sure, now I probably seem crazy talking about Instant Gratification Monkeys and a Dark Playground, but for the first time in my life as I was processing everything that Saturday night, I was able to visualize my problem, and from that, thoughts started swarming around in my mind. I should probably mention right away I am not a Catholic (in fact, I was once even kicked out of the Vatican’s St. Peter’s Basilica, but that is another story for another time. Well, perhaps, for it really isn’t as interesting as the two times I was kicked out of different Sunday schools). Rather, I am a fifth generation Methodist, but as you can probably guess with my New Year’s Resolutions, there is no way in the world I could pass on something like giving something up for Lent. The testing of will power is just fun, so for I am not sure how many years, I have always found something to do without as I waited for Easter to come. The list is long and some of the things have been popcorn, peanut butter, tortilla chips, candy, all fried foods, and impulse buying (I also go for the whole period between Ash Wednesday and Easter with no getting a break on Sundays. With my not being a Catholic, I was unaware that was an option until not too long ago. Hearing about that loophole of sorts explained very well the questions that came the year I actually counted each day and found there to be more than 40 (that was a particularly tough year)). This year I had been stumped on what to give up until I ran across the article that changed my perspective on procrastination. And then it was easy – I was giving up the Dark Playground while learning how to control the Instant Gratification Monkey. This last week has been hard to say the least, but when the temptation strikes, I call it for what it is, which sometimes causes people to look at me funny with my talking about a monkey (definitely check out the blog to see a picture of the little guy). However, I am still fighting those temptations and will be at least until Easter arrives with the only acceptable trees in the Dark Playground to climb are the ones in the forms of my New Year’s Resolutions. Oh, then there is an extra credit option for Lent for me too. Lately, it seems many people are all about adding things to their lives for Lent, so I decided to do the same with my adding working on my novel each day as well. For some days, it has just been a couple of sentences. For others, it has been a couple of paragraphs. This weekend I am planning on a couple of chapters. Regardless of the length, this too has been a great addition to my life all thanks to Lent. I’ll bet the current Pope wouldn’t have booted you out of St. Peter’s. There is a good chance of it. What happened was basically I was on this great tour with an official Rome tour guide; however, she was not an official St. Peter’s tour guide. Pope John Paul II wanted everyone and anyone to visit St. Peter’s so he let all tour guides bring their groups there. Pope Benedict did not have the same mindset, so upon realizing there was a sort of tour going on (she had warned us this could happen so she was making it as informal as possible), they kicked us out. I would imagine Pope Francis has a similar mindset to Pope John Paul II (but I may be wrong). Regardless, it makes for a good line about getting kicked out of the Vatican.